In the previous post "Dirty secrets on dependency injection and Angular - part 1", you've explored how DI at component level, can produce different instances of a service. Then you've experienced DI at module level. Once a service is declared using one token in the AppModule, the same instance is shared across all the modules and components of the app. In this article, let's revisit DI in the context of lazy-loading modules. You'll see the feature modules dynamically loaded have a different behaviour. Let's reuse the tour of heroes app that you should be familiar with from our previous post. All source code could be find on github. As a reminder, in our Tour of heroes, the app displays a Dashboard page and a Heroes page. We've added a RecentHeroCompoent that displays the recently selected heroes in both pages. This component uses the ContextService to store the recently added heroes. In  you import SharedModule which defines common components like SpinnerComponent, RecentHeroesComponent. Note in  that HeroService is defined as provider in both modules. It could be a candidate to be provided by SharedModule. This service is stateless however. Having multiple instances won't bother us as much as a stateful service. In , the declarations section is really lean as most components are declared either in the features module or in the shared module. In , you now import the SharedModule form AppModule. SharedModule is also imported in the feature modules. From our previous post we know, in statically loaded module the last declared token for a shared service wins. There is eventually only one instance defined. Is it the same for lazy-loading? In  we defined the module for lazy loading, more in next section. In , providers section is lean similar to declarations as most providers are defined at module level. In , you'll define lazy load DashboardModule with loadChildren routing mechanism. Running the app, you can observe the same syndrom as when we define ContextService at component level: DashboardModule has a different instance of ContextService than HeroesModule. This is easily observable with 2 different lists of recently added heroes. Angular adds @NgModule.providers to the application root injector, unless the module is lazy loaded. For a lazy-loaded module, Angular creates a child injector and adds the module's providers to the child injector. Why doesn't Angular add lazy-loaded providers to the app root injector as it does for eagerly loaded modules? The answer is grounded in a fundamental characteristic of the Angular dependency-injection system. An injector can add providers until it's first used. Once an injector starts creating and delivering services, its provider list is frozen; no new providers are allowed. In  remove ContextService as a providers. Define in  a forRoot method (the naming is an broadly accepted convention) that returns a ModuleWithProviders interface. This interface define a Module with a given list of providers. 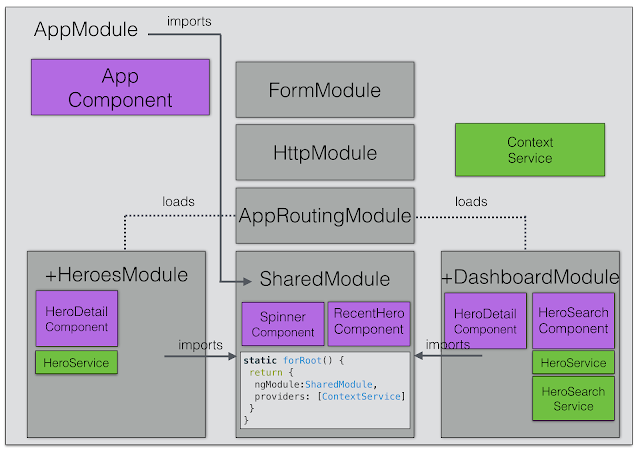 SharedModule will reuse defined ContextService provider defined at AppModule level. In all feature modules, imports SharedModule. In  and , replace the SharedModule imports by SharedModule.forRoot(). You should only call forRoot at highest level ie: AppModule level otherwise you will run in multiple instances. 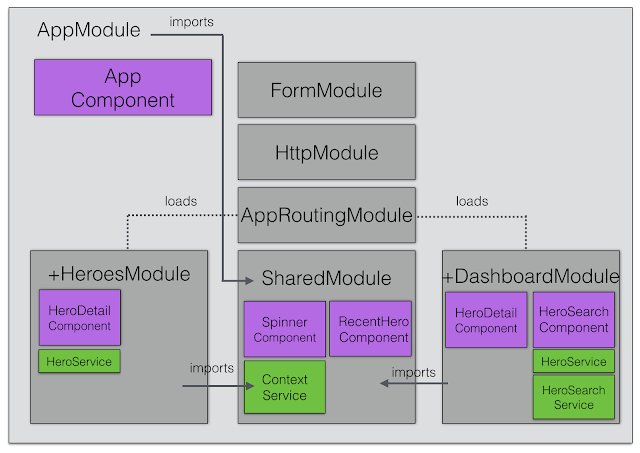 In this blog post you've seen how providers on lazy-loaded modules behaves differently that in an app with eagerly loaded modules. Dynamic routing brings its lot of complexity and can introduce difficult-to-track bugs in your app. Specially if you refactor from statically loaded modules to lazy loaded ones. Watch out your shared module specially if they provide services. The Angular team even recommends to avoid providing services in shared modules. If you go that route, you still have the forRoot alternative.